The Midnite Drive-In: What's in the Bag? 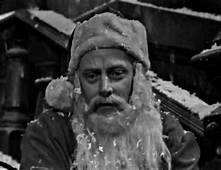 This is Mr. Henry Corwin, normally unemployed, who once a year takes a lead role in the uniquely popular American institution, that of a department store Santa Claus in a road company version of "The Night Before Christmas". 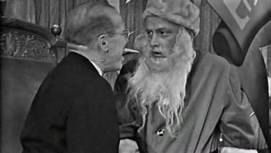 But in a moment, Mr. Henry Corwin, ersatz Santa Claus, will enrter a strange kind of North Pole, which is one part the wondrous spirit of Christmas and one part the magic that can only be found in the Twilight Zone. 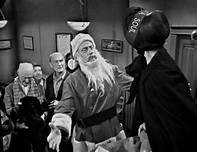 The opening of this episode features Henry Corwin (Art Carney) commiserating with Bruce (Val Avery), a bartender at a bar where Corwin has gone on his lunch break from a job as a department store Santa. Henry is an alcoholic, obviously, since he has forgone most of a sandwich in favor of six shots of liquor. Corwin is a sentimental idealist. 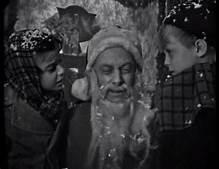 He wonders why there is no real Santa Claus. The poor kids in his neighborhood get nothing for Christmas, and Corwin feels that they deserve better. Back at the department store, obviously three sheets to the wind, Corwin takes his chair as Santa. His first kid is a snot-nosed brat named Percival Smithers who when asked what he wants for Christmas declares "a new first name". (A side note here: Try as as I might I could not find a correct credit for the kid who plays "Percival". IMDb incorrectly attributes it to "Andrea Darvi". The little girl who appears early in the episode is whom is portrayed by Darvi, not the obviously boy named "Percival". It appears his name is lost to obscurity.) 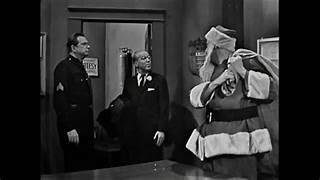 When Corwin crashes to the floor drunk, Percival's mother (Kay Cousins) irately complains to the floor manager, Mr. Dundee (John Fielder), who summarily fires Corwin from his Santa Claus job. Corwin stumbles from the department store back to the bar, but is refused entry. So he heads back towards his rooming house. But in an alley he surprises a cat sitting atop a bag of garbage. When the jingle of sleigh bells jangle, Corwin notices the bag is not filled with garbage, but a mound of goodies. 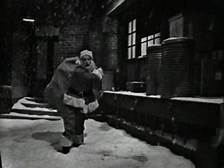 He proceeds to hand out the goodies around his poorer neighbors, including the shelter where the homeless men are being preached to by a woman , Sister Florence (Meg Wylie). (One of the homeless is a character actor you will immediately recognize if you watch much old TV and movies, Burt Mustin). The suspicious Sister calls the police and Officer Flaherty (Robert P. Lieb) takes Corwin and his bag into custody. 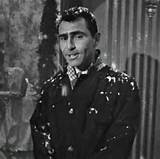 He contacts Mr. Dundee who shows up and smugly declares that he hopes Corwin goes up the river for a long time for the theft of valuable goods from the department store. Wait! Valuable goods? You mean these empty tin cans? And the cat? This trash is valuable? Dundee berates Flaherty for wasting his time, but Corwin declares the bag has a magic. Dundee demands proof in the form of a vintage bottle of brandy, which Corwin promptly produces. 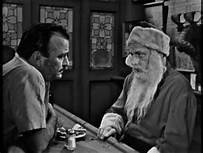 Leaving Dundee and Flaherty stunned, Corwin exits the police station and continues his role a Santa delivering toys to the poor children of his neighborhood. A word to the wise to the children of the twentieth century, whether their concern be pediatrics or geriatrics whether they crawl on hands and knees and wear diapers, or walk with a cane and comb their beards. There is a wondrous magic to Christmas and there's a special power reserved for little people. In short, there's nothing mightier than the meek. I leave you with blessings of the season and hope tonight and tomorrow bring your fondest desires. Drive home safely, folks. Thanks for this post. 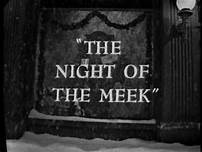 Night of the Meek is one of those TZ episodes I always like to re-visit during the holiday season. Merry Christmas and Happy New Year, Quiggy. I recently acquired the full run of the original series. I have seen many of them on TV over the years, but I think I've only seen this one once before I got the series. I like the ones that had happy endings. Thanks for reading.